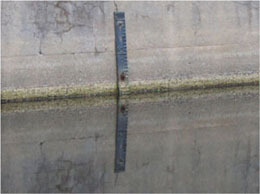 Who controls the water level? The water level is controlled by IF&W (the Maine Department of Inland Fisheries and Wildlife) and Mother Nature. How is it controlled? 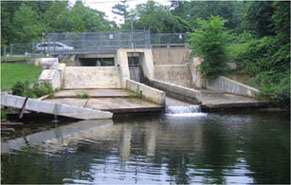 ; The water level is regulated by the dam on Mill Street. 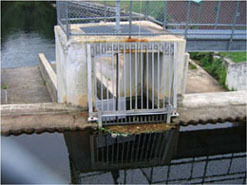 The dam has a manually operated single gate with bottom release. It takes time for stormwater to work its way through the system. After a heavy rain, even with the dam open, the lake level will continue to rise for several days. Unpredictable spring melting just adds to the problem. The dam isn't big enough to let all that water out quickly, and that would likely flood the area below the dam anyway, so it takes a while to make adjustments to the level. (Panther has a surface area of 1,439 acres, so it takes an outflow (plus evaporation) of almost 40 million gallons more than what's coming in to lower the lake level by one inch.) In the graph below, you can see the effect of the 2007 Patriots' Day storm. It took weeks to get the lake level back down after that event. 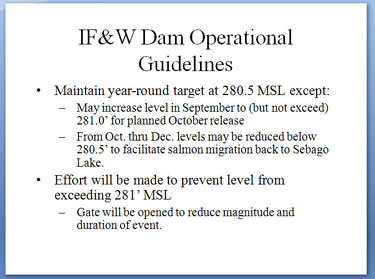 IF&W may open the dam in anticipation of an expected storm. If that storm then fails to happen, it takes time to get the water level back up to where it should be. How is the water quality being tested? "Working with the Maine DEP staff, Charlie Turner and other volunteers from RWPA have tested water quality in Panther Pond for over 30 years. 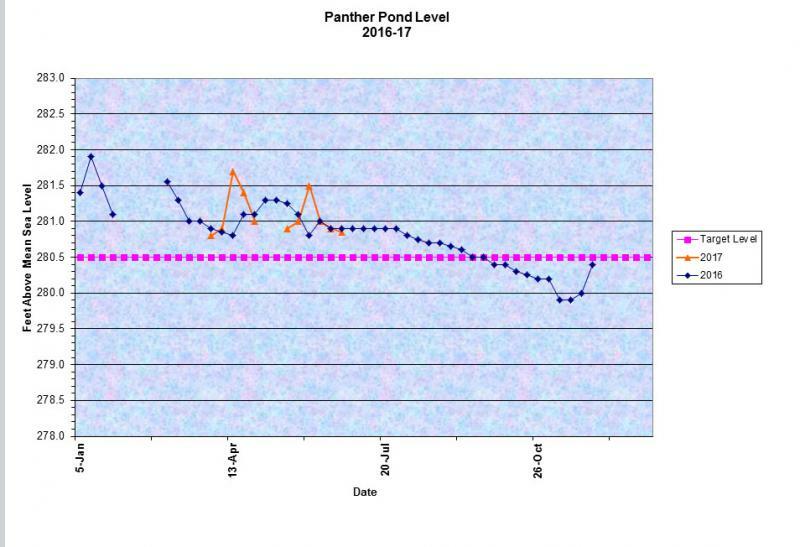 According to this data, Panther Pond’s water quality is considered above average, and the potential for nuisance algae blooms low. "The long-time average water clarity is about 20 feet - about 5 feet clearer than the average Maine lake. Despite these positive indicators, the bottom waters of the lake experience some oxygen depletion in the late summer months. This oxygen depletion may be an early warning sign that the pond is under stress, and if this worsens over time, the pond’s coldwater fish habitat would be impaired. "As a result of the monitoring and the area’s development trends, Panther Pond has been placed on the State’s “Nonpoint Source Priority Watersheds” list, which means the lake is threatened or impaired by polluted runoff. 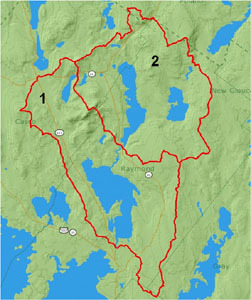 In addition, MDEP has included Panther Pond on their list of “Lakes Most at Risk from Development” under the Maine Stormwater Law. Future development, unless done properly, will further degrade the water clarity and quality of Panther Pond. "Water quality problems can be attributed to polluted runoff that washes into the lake from its surrounding watershed. Phosphorus, which attaches to soil particles, poses the greatest threat to Panther Pond. Phosphorus spurs excess algae growth, causing declines in water clarity and oxygen levels. Ultimately, high inputs of phosphorus can lead to a degradation of fish habitat,development of nuisance algae blooms, and losses in lakefront property values." 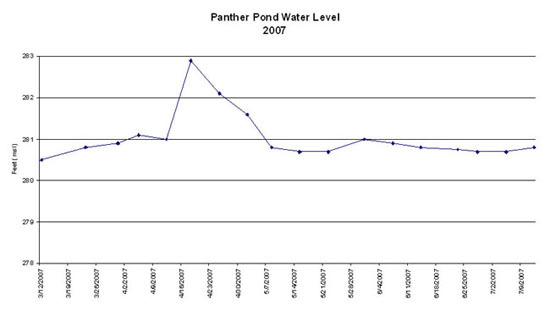 "the water quality of Panther Pond is above average compared to other Maine lakes. With increased public awareness and continuing efforts to reduce the input of phosphorus to the pond, the water quality will remain stable and might even improve over the long term." For the complete report and accompanying data, please click here. Says Charlie: It was a pretty much usual year, although we had two large rain storms, which did affect clarity somewhat . . ., Bottom temps varied less than 2 degrees the entire summer, not unusual. from 46,9 to 48.2 degrees. Surface temps are shown in the chart [above], along with the O2 results and the corresponding dates when the tests were made. Really good news: note how well the dissolved oxygen readings held up this year. What are those green dots floating in the water? What about the green "cotton candy," foam, and other slimy stuff? What happens when the lake "turns over"? As the lake turns over, oxygenated water is carried to the usually oxygen-poor deeper layers of the lake, while rising bottom water may bring with it sediments that temporarily decrease the clarity of the lake. In the spring, the nutrients brought up by the rising bottom water can kick-start the growth of algae in the upper layers of the water column. As temperature and oxygen levels change, fish will move to different depths, seeking the most comfortable levels.